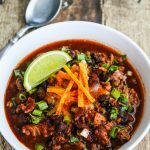 Slow Cooker Turkey Bean Chili is a crowd pleaser, with umami from mushrooms and smoky ancho and chipotle chili flavor. It’s budget-friendly, can be made ahead of time, and is freezable. Perfect for casual entertaining, whether for friends or family. I make a big pot for lunch during our family Christmas gathering. 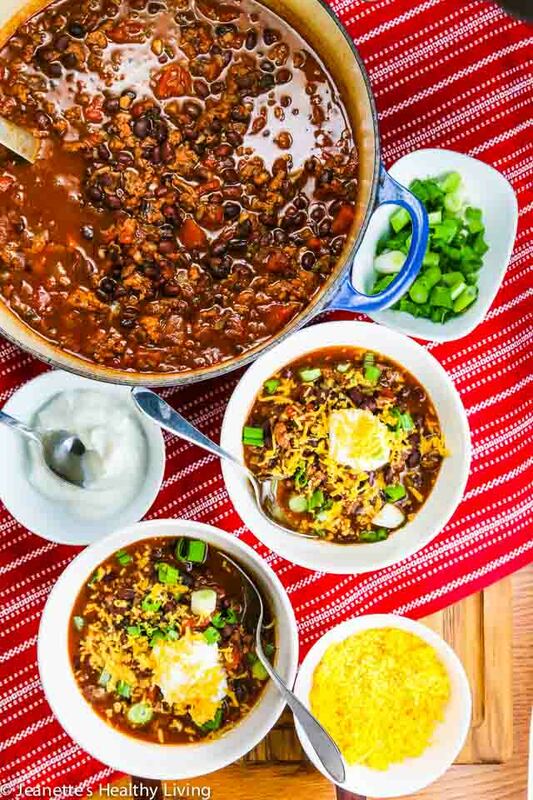 Serve with a variety of toppings and let your guests customize their own chili bowl. 234 calories/2 freestyle points per serving. We’re in the thick of winter and stews, chili and soups have been on our weekly menus lately. During the wintertime, our bodies crave rich foods, and oftentimes, these foods are heavier and higher in fat. However, that can lead to those extra couple of winter pounds I gain. 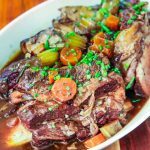 So, I’ve been trying to satisfy these cravings with comfort food that’s been lightened up, without sacrificing on flavor or heartiness. 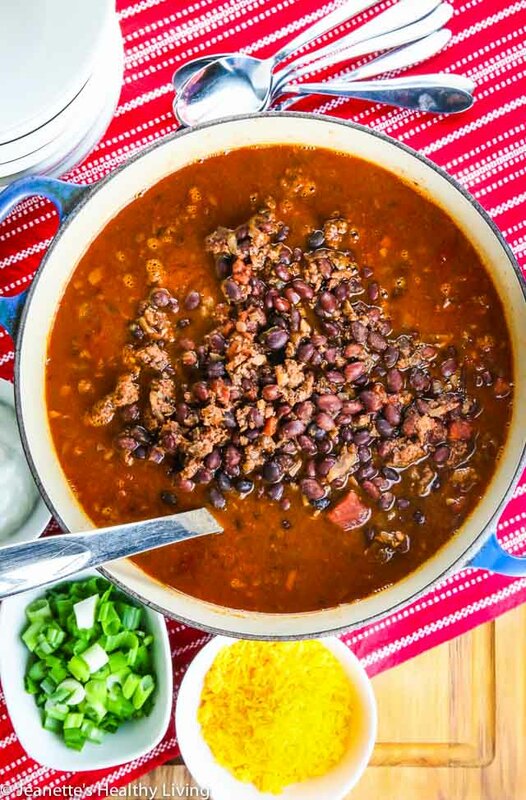 This Slow Cooker Turkey Bean Chili is heavier on the beans than on the turkey. 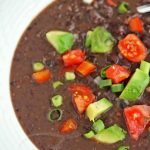 I use whatever beans I have in my pantry – black beans or red beans of any variety. That means, more fiber and plant based protein, with the added benefit of being a low-cost family meal, great for entertaining too. Love it when that happens. Mushrooms add some nice meaty flavor with far fewer calories. Chopped up fine, they meld right into this chili and add some bulk. An assortment of toppings make this slow cooker turkey bean chili especially fun for parties. Have some fun with your favorite toppings, including any of the ones suggested below. Serve buffet style with bowls of all the toppings so your guests can customize their chili bowls. Another idea I learned is to serve all the toppings in a bar condiment caddy. Corn muffins or cornbread on the side are also a wonderful accompaniment. Heat olive oil in a large stock pot over medium heat. Add mushrooms and onions and cook until onions are translucent, about 5 minutes. Add garlic and cook another minute. Add ground turkey and cook until browned and cooked through. Add oregano, cumin, chili powder, ancho chili powder, and chipotle chili powder. Stir well and cook until fragrant, about a minute. Add black beans, tomatoes, bean cooking liquid, and salt and pepper to taste. 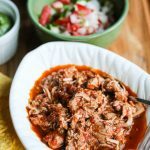 Pour chili into a crockpot and cook on low 6 hours to develop flavors. Alternatively, continue cooking chili on the stovetop on low heat for 1 hour. Serve with variety of garnishes on the side. 2 freestyle points per serving. Chili never fails to satisfy my comfort food cravings! And I love how healthy it can be. This looks like one tasty bowl. 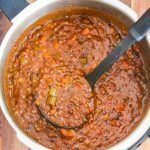 Joanne – I couldn’t agree more – chili definitely falls into that comfort food category. 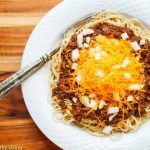 Great minds – I made slow cooker chili yesterday for lunches this week! I started making dried beans and freezing them. Perfect for recipes like this! Great idea Liz – I love using dried beans and cooking them myself – going to make double batches next time and freeze them. Yum! This looks so delicious, Jeanette! Definitely pinning this to make in a couple of weeks. I don’t eat any red meat so I haven’t had chili in a while, but this sounds amazing. I’m a huge fan of filling up a pot with a lot of different kinds of beans to make it more hearty. This sounds perfect for a cold winter night. I also do a weekly “Must-Read Monday” on my blog. I’m going to include a link to it next week. All your recipes look so good! 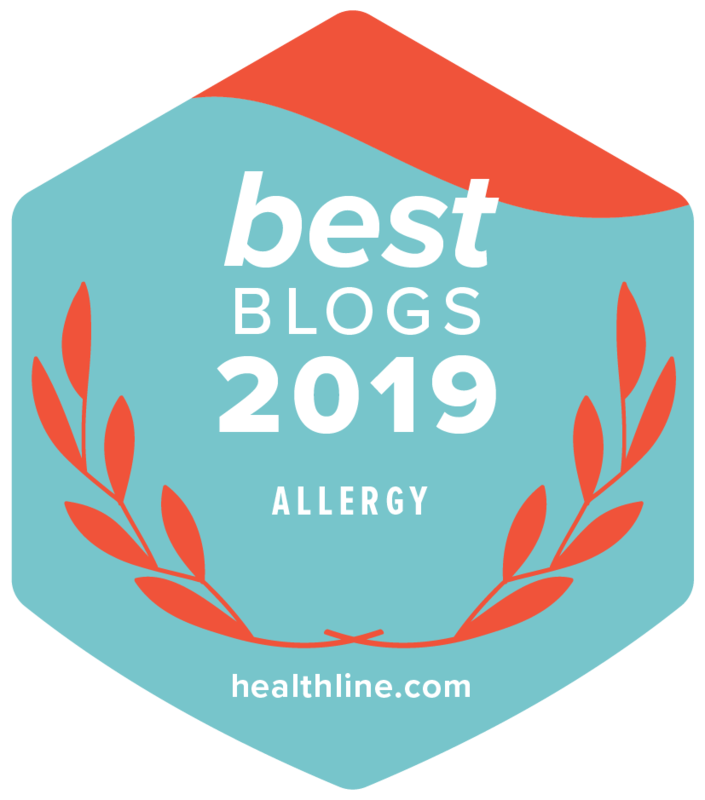 Thanks so much Alex – ground turkey and chicken are great healthy substitutes for beef, and using a larger proportion of beans to meat amps up the fiber. Love using a variety of beans in chili too! Thanks so much for including me in your Must-Read Monday post next week! 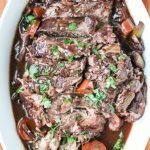 You always have the best slow cooker recipes Jeanette! 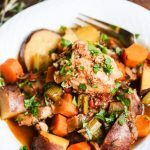 This looks delicious-will be adding it to my slow cooker list for sure!!! I love your all your slow cooker meals! A big bowl of comforting chili sounds perfect for these colder winter months. Love all the mushrooms and black beans in here 🙂 Pinning and thanks for sharing Jeanette! I think the slow cooker has to rank right up there beside the toaster as one of the world’s greatest inventions ;-). Lovely chili Jeanette. Warming, satisfying and nourishing. MMMMM! Love chili! I’ll add this one to my recipes-to-try pile. Right now our family is loving chicken chili with whitebeans and swisschard, and traditional ground beef and kidney/whitebean chili. Thanks for this! Robyn – I just made white chicken chili the other day, but with no greens – love the idea of twirling some in. This looks wonderfully delicious, Jeanette! 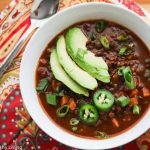 I love chili…and I love your version…a healthy choice! Thanks Kathy – always looking for ways to lighten things up with the added benefit of being less expensive! I can eat chill during any season. I love your recipe, Jeanette. It sounds so healthy and full of great flavours. Thanks so much Nancy – we’ve been eating a lot of chili this winter – warms the soul. This is so perfect for winter: warming, comforting and satisfying. Everything is just inviting to sit in and enjoy! Gintare – yes, chili is perfect for a cozy winter day. Jeanette, this looks wonderful. I would not have thought to use black beans in my chili so this is a welcomed change. Definitely will try it this weekend! This look delish! I’ll definitely be making this dish soon. Thanks! Thanks Shari – hope you enjoy this! 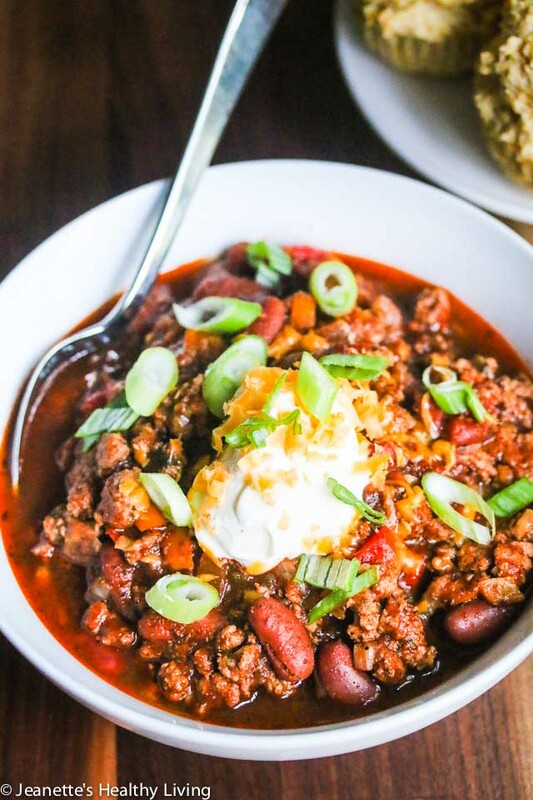 Chili is the perfect recipe for a slow cooker. Yours looks amazing! Yum! I love that you went with dried beans in the slower cooker and calling it Black Bean Turkey Chili. Perfect for winter lunches or dinners. Cannot wait to make this, Jeanette! It will make my hubby especially happy. Thanks for sharing and have a great weekend! Made it tonight and everyone loved it! I added some frozen color for corn and texture but other than that I kept to the recipe and in this subzero weather it hit the spot! Lena – so glad you all enjoyed this. Great idea adding some corn for extra texture. Stay warm! This looks so good, Jeanette!! 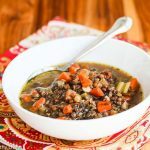 I love to make soups in the winter and this has been some winter around here! I was wanting a new one to make and I have a pound of turkey and I think everything else! You have such good recipes, just love receiving your newsletter!! Thanks Nancy – I really appreciate your feedback. I hope you enjoy this chili recipe. It’s been so cold this winter, I’ve been making a lot of chili, soups and stews. My blog is in the very same area of interest as yours and my visitors would genuinely benefit from a lot of the information you present here. Hi Fred – you may link back to my site for the recipe. Please do not use my photos or recipe on your site. I appreciate your integrity. 1. I know it makes 10 servings. What is the serving size? 2. Can I use canned beans? Not optimal, but time is crunched. Hi Lisa – I don’t remember the exact serving size, but it should be plenty a 4 year old party. If you want, serve over steamed rice or with corn muffins (mini ones would be fun for the kids). Canned beans are perfectly fine – I would just suggest rinsing them in water and draining them before adding to the pot. Thanks so much for your kind feedback – I really appreciate it. You are awesome. Thanks so much for the quick reply! I’m so glad you think mini corn muffins are a good idea – they’re on the menu! Love that you thought of mini corn muffins – kids love anything mini (so do adults!). Hope you have a fun party! I know everyone will appreciate the effort you put in to cook them something healthy and delicious for their kids! I made this today Jeanette for Sunday supper. Tis the season!!! Black beans are so flavorful. Will do this one again. ???? Hi John – so glad you enjoyed this for dinner tonight! Yes, it is chili season – definitely feeling like Fall. I just made some black beans this weekend and have extra, so going to make this for my family this week. yummy recipe with great nutrition value, it is well healthy for kids, thank you for sharing this healthy delicious food among us.